WesleyLife has been gratified by the outpouring of interest in Brio of Johnston, their first 55-and-older lease community! Their focus on vibrancy and activity seems to be resonating, as Independent Living at Brio is nearly three-quarters full. 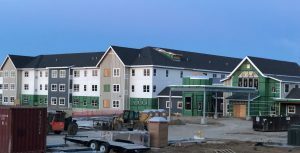 They also offer Assisted Living, Memory Support, Long-Term Care, and Skilled Rehabilitation, and they look forward to welcoming residents when we open our doors on schedule this fall at 6901 Peckham Street. They are currently hiring for all Brio positions, so they invite anyone with an interest to visit wesleylife.org/careers and browse our opportunities! For information about Brio, call Susan at (515) 253-2500, or visit their website.